The Angriest: Star Trek: The Next Generation: "Second Chances"
It is 24 May 1993, and time for the 150th episode of Star Trek: The Next Generation. The Enterprise travels to Nervala IV, a planet covered by a dangerous distortion field, to retrieve valuable data from an abandoned science station. That station was evacuated eight years earlier by the USS Potemkin, back when Will Riker (Jonathan Frakes) served as its lieutenant. With only a narrow window existing to retrieve the data before the distortion field returns, an Enterprise away team beams down - only to run into an alternative Riker who never left the planet's surface eight years earlier. "Second Chances" is based on the most inspired of premises. 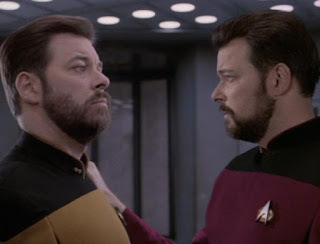 That a transporter accident duplicated Riker eight years earlier - one who advanced in his career, broke up with Troi (Marina Sirtis) and moved onto the Enterprise, and one who languished alone on a desolate planet without anybody knowing he existed - is kind of secondary to the emotional core. What would you do if you met the version of you who made different life choices? How would it make you reconsider your life? The result is a stunning character piece, not only for Riker but for Troi as well. The episode spends a little more time with Lieutenant Riker, the man who has been alone for eight years, hoping for nothing more than to see Troi again. It's an awful situation: he is overwhelmed to see her again, but she has moved on. It is terrible for him: he has waited so long for something only to lose it at the very end. It is terrible for Troi: after putting her feelings for Riker aside she's suddenly forced to re-live them. It is terrible for Commander Riker: he too had moved on, and now seeing his alternate self attempt to rekindle a romance he is forced to recognise his life choices and what he missed. It does not really matter if the situation is a little silly, and the scientific jargon rather dubious. What matters is that two of the regular cast are pushed into a difficult situation and the script then explores how they react. It is a wonderful character piece, and a godsend for both the characters and their actors. Jonathan Frakes does superb work here, playing two immediately recognisable versions of the same man. He handles the double-Riker scenes with aplomb, as does director LeVar Burton - who makes his directorial debut here. Burton handles the entire episode well, giving it the pace and character focus that the material deserves. I think, in an episode so heavily reliant on Frakes' performance, it is easy to overlook how well Marina Sirtis plays Troi. It is some of the most well-developed and three-dimensional character work she has ever received on the show, and she excels with it. When the episode reaches its conclusion, and the new Riker winds up making the same relationship-breaking choice that his predecessor did, she does amazingly subtle work in reacting. The smallness of it - the quiet self-control - makes it even sadder. This is one of my favourite episodes of The Next Generation. It actually feels like it matters to the characters. It is an exceptional case of using science fiction trappings to tell a personal story. We are 24 episodes into Season 6, and this is the 16th good episode. The quality ratio rises to 67 per cent.